I haven't blogged in two years... mega oops. I had a baby, if that explains things lol. But I'm back and I have a few new blog post ideas up my sleeve. Stay tuned. First, I thought I'd share my end of the year parent gifts. I put them on TPT (here) for $1 just in case anybody also wants to buy the charms ($4.99 on Amazon for SEVENTY of them... You read that right lol. I bought them and they're legit.) to keep it affordable. 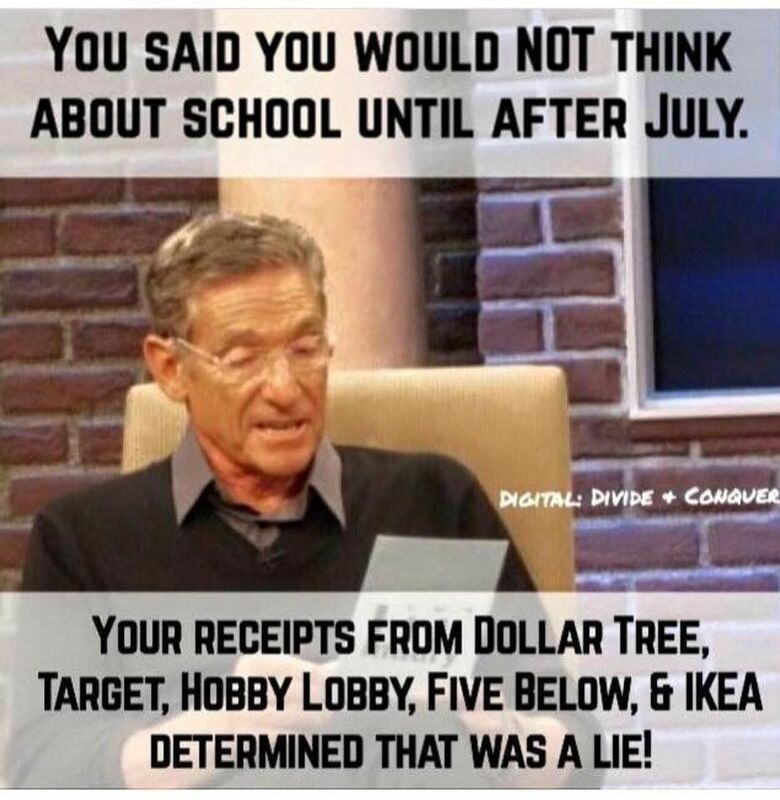 Because you know you're going to raid Target this summer for your classroom, no matter how much you try to resist. Yeah, this waaaayyy too true. Sigh. Anyway, here's what the end of year gifts look like if you'd like to check them out. I also made one shaped like an apple and threw in one that has an apple printed on it in case you don't want to buy the charms. 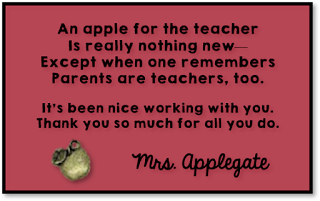 See what I did there, Applegate? Tee hee hee. Figured I had to throw a mom joke in there since I'm a mom now. Gotta run. Thanks for reading! Poetry. That dreaded word. It sends shivers down our students' spines. It even sends some teachers into cold sweats. I remember thinking I hated poetry in school, until my teacher introduced me to Shel Silverstein. I fell in love with poetry, and I was determined to make my students do the same. I decided to host a poetry slam and to make a fun poetry project that would get my class interacting with poems. I could just teach them the different types of poems, but would they remember them? I started off the unit with a bag of candy and told the class we'd be learning about how to write candy poems. That got their attention! We wrote odes to their favorite candies, and they were starting to come to the dark side, hehehe. I decided to create a whole poetry project with a component that teaches the types of poems and a forum that let students exercise their creativity and write each type of poem. I bought a pack of felt berets and a pack of sunglasses from Amazon. Guess what? THEY. LOVED. IT. I loved it. My entire class could tell me all the types of poems by the end of the project. Help your students develop a love for poetry with this fun poetry project and poet craft. First, teach the different types of poems using the "Types of Poetry" booklet and slides. Next, have students create their own poems using the "Collection of Original Poetry" student poetry booklets. Each booklet has the necessary number of lines for each type of poem, which provides appropriate scaffolding and makes a great assessment. Finally, students create a poet craft using their own faces. This craft gets attached to students' poetry booklets for a fun hallway display. This is a great project for back to school, National Poetry Month, to accompany a poetry unit, or even for the last week of school. Host a poetry slam as a culminating poetry project. Invite parents or another class to watch students perform their favorite poems. Bring in a stool, spotlight, berets, and sunglasses, and watch students' poems come to life! Get it from my Teachers Pay Teachers store HERE. Do you have any fun things you do to teach poetry? I'd love to hear about it in the comments below! I didn't have a very big bulletin board, but I did have a big empty wall space. I bought a cheap black bed sheet, cut it, and used a hot glue gun to stick it to the wall. I attached border with a glue gun, as well. I took on this project solo, so I glued the center first. That way, it wouldn't fall down while I tried putting it up. To figure out how long to cut it, I counted the floor tiles along the wall. Then, I spread the sheet across that many floor tiles and cut it to size. Next, I counted the number of cinder blocks on the wall and divided by two to find the center block. I put hot glue on the center block, stuck the sheet up, and worked my way outward. I also glued the letters on starting with the middle letter. It's tough to see because the board is longer than my camera's view, but it says, "Our Best Work," with colorful clothespins. It makes it really easy to display student work throughout the year, because I can't use a stapler since it's not a real bulletin board, and we all know what happens when we try getting tape to stay on cinder block walls. I turned my filing cabinet into a matching magnetic bulletin board by hot gluing the rest of the bed sheet, letters, and some border. I have my students develop our class rules on the first day of school. We write it and put it on chart paper, which I then attach to this bulletin board. The cute little stars from Graphics from the Pond are what I use for my clip chart. When a student's clip gets to the top of the chart, the whole class cheers. Kids can clip each other up and earn clip-ups for noting the positive in one another-- including those who aren't their bffs. This really has helped the climate of my classroom, and we were able to phase the clip chart out by the end of the year because they were just motivated to be nice to each other because it felt good. This is a simple little classroom organization technique that we build in with our procedures. Every morning, students get morning work from the unfinished bin, and all completed work goes into the finished bin. There's a sharp and unsharp pencil cup, so nobody ever sharpens pencils during class time. One student is in charge of making sure the pencil cup is filled and sharpened. I also keep caddies between students' desks containing all needed materials (i.e., pencils, highlighters, crayons, colored pencils, dry erase markers, glue, scissors, and paint brushes). Kids know where we keep paper, and all manipulatives are stored in plastic cereal containers so I never have to pass them out or collect them. On students' desks, I put some Wall Pops (or, as I call them, Desk Pops!). We have a competition to see who can respect his or her space and keep the Pops in good condition. To keep kids competing with themselves instead of with each other, you can try to get them to beat their personal records for number of days left in good condition. Or, you could just buy a bunch of them and accept that some kids need to pick at them and go on with your day, haha! These are great for word work or math facts practice if kids finish their work early. My kids who like to write to learn love using them. I use them as incentive for reluctant learners to finish their work so they could draw on their pops. Sometimes I write encouraging notes, reminders, or lesson materials on their pops. They work well for Scoot games, as well. I'm so fortunate to have a SMARTBoard-- so much so that I never use my chalkboard. I thought about having it taken down to free up some wall space, but then I thought- hey, why not use it as a magnetic word wall? It was easy to just write the words in with chalk. This year I'm going to try to make magnet-backed words so students can bring them to their seats to use while writing. I also made a focus wall on the chalkboard. This goes along nicely with our Reading Wonders: Wonder Works curriculum. Last year, I wrote out my objectives each week as I went and wrote "Unit ___ Week ___ Day ___" on the back of each. During downtime (or the end of the year), we laminated them and filed them to use for next year. Should be really easy to just pull them out and stick them up! It's a nice spot for students to reference and for me to use for quick review. I also have a "MUST DO" and "MAY DO" spot that I made with my Wall Pops. With dry erase marker, I write all of the assignments students need to complete in the top circle, and in the bottom I write everything early finishers can complete. You could also write incentives in the bottom circles to entice reluctant workers to complete their work. I used the font MTF Jumpin' Jack for most of my classroom displays. Because I teach learning support and the original font has uppercase letters and some lowercase letters, I substituted some letters from Kimberly Geswein fonts. I love her easy-to-read KG Second Chances font. I used my Silhouette Cameo paper cutting machine to cut them out, but you could also print them in different colors and cut them out. I laminated the letters, but when I cut them out, I left some lamination between the letters so I ended up with whole words and not a ton of tiny letters floating all over the place. Have any classroom decor ideas you love? I'd love to hear about them in the comments! I always see the cutest ideas for classroom doors, but then I remember, "Oh, yeah. I'm not artsy." I pretty much look at something and decide it's a Pinterest fail waiting to happen. Printing out cute clipart, though? Now, THAT I can do. Just print a couple pictures and a slogan in a nice font (or recruit a family member to hit up the die cut machine), and you're set. This was a door I made that was soooo easy, thanks to clipart I bought from Scrappin' Doodles. Print, cut, stick to door, done. I cut out a few black rectangles and a bunch of yellow squares for the windows and stuck 'em together. I used font from Graphics from the Pond. I actually measured my door at school and then made the buildings at home while watching trashy television. Score! I can never get the spot where the doorknob goes to look like a grown-up cut it out, so I made a yellow star-ish shape with an X cut into it and popped it over the doorknob. Easy peasy! Here's another door I made using my Silhouette Cameo. If you're not familiar, it's a paper-cutting machine. It works like a printer, but instead of printing with ink on paper, it cuts paper. It's pricey, but I've used it so many times. I love it. For this door, I used the font MTF Jumpin' Jack and had my Silhouette Cameo cut out the shapes on different colored paper. You could probably do the same thing by printing the letters in color on paper and cutting them out. I laminated the words at home, but when I cut them out, I left a tiny bit of lamination between each letter. That way, the letters stuck together and I only had to tape words to my door and not individual letters... Because, as Sweet Brown said, "Ain't nobody got time for that." Have any door ideas you love? Share in the comments! You Lost Your Patience with a Student and Feel Terrible... Now What? We've been getting asked a really similar version of the same question recently in our Emotional/Behavioral Support Crew Group, and I know most teachers have been there at some point, so that brings us to today's blog post. Christy asked, "Some days I feel like I handle situations well and other days I have an overwhelming feeling of guilt and disappointment with regard to how I handled a situation. I don't always handle a behavior in the best way. I know I am only human but it crushes me! Do you have things you do to build yourself back up? How do you cope with feelings of regret or left-over frustration with yourself?" Krista asked, "Do you ever lose your temper and then feel really bad about it afterward? I yelled at [some students] today and now I feel bad... And I had just had a proud moment with one of them the other day, and now another set back! Ugh!" You may not feel like it, but you're one of the good ones. After losing your patience with a student, you're feeling guilty, sad, frustrated, the whole nine. You can replay it, lose sleep, and beat yourself up over it, but will that change what happened? Nope. My friend's grandma used to say, "Worry is like a rocking chair. It gives you something to do, but it doesn't get you anywhere." Remind yourself of this: The fact that you asked this question, decided to read this blog post, or gave it a second thought-- that shows that you're one of the good ones. You care, and that's everything. Remind yourself that you're one of the good ones, and allow yourself permission to get off the rocking chair. Looking back on a situation, it's pretty easy to see what we should've, could've, or would've done. It's easy to see how we should have responded to stimuli when we take the emotion and environmental factors out of the equation. In the moment we lost our cool, though, we were experiencing responses to emotional and environmental factors. We had a meeting and paperwork during lunch (low blood sugar), high pressures due to state testing and work demands (stress), lack of time needed to complete important tasks (anxiety), and a class of students who need us (passion). So look at this objectively-- Low blood sugar + stress + anxiety + passion = Ut-oh. We learned all about Maslow's Hierarchy of Need in our educational preparation, and guess what? That same stuff applies to adults, as well. Behavioral caregivers and educators sometimes experience what is known as secondary trauma. It is under the umbrella of post-traumatic stress disorder, PTSD. People who care for individuals who have experienced trauma may themselves experience traumatic responses. Self-care is incredibly important here. It is crucial to cut yourself a break. You are only human. It can be incredibly difficult to manage the demands of teaching and also experience daily emotional and/or physical aggression. Reach out to the teachers in your building who may teach students who have experienced significant trauma, and come to them with something positive. Often, teachers of students who have significant behavioral needs have several teachers come to their classrooms each day with "bad news," and that can be difficult, as well. But We Can't Make Excuses. We Must Make Amends. Still, though, we can't make excuses. 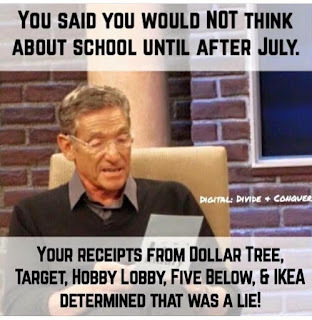 If we made those excuses every day and didn't work to modify our own behavior, we'd be as "highly effective" as Mr. Kimball, Madame Umbridge, Miss Trunchbull, Mr. Garrison, Ms. Halsey, any of Charlie Brown's teachers, Mr. Rooney, or Ferris' Bueller's economy teacher. So what can we do? Channel the guilt into making yourself better. What will you change in the future? What will you do the next time you feel frustrated with this particular student-- or another? How will you take care of yourself? Maybe start walking or running, practicing yoga, buying an adult coloring book, meditating, taking up a hobby, therapy, whatever helps you. Write a behavior plan-- for the student, and then one for yourself. Tell yourself what you would tell your student, that it's okay to feel angry, but with self-control we don't have to act angry... angrily? Grammar fail. Keep track of how often you do keep your cool, and make that your new goal/habit. Maybe reward yourself when you keep up with your goal. Remind yourself why you went into teaching. Be the teacher you'd like to have when you were a student. We can uplift or crush our students' spirits. Make it your mission to give this student some extra attention and praise this week. Make it your mission to uplift his or her spirits all day tomorrow. As they say, often the students who need the most love may ask for it in the most unloving ways. I remember being in school, and my teacher got really frustrated with us. Our whole class kept talking, and she had patiently asked us to stop about a bazillion times. It was a gorgeous spring day outside, and we just wanted to go out for recess. I had just learned how to whistle and started whistling, completely unaware that this was not something you should do in the classroom. I had done it at home, and everyone praised me, and at recess the day before I was the cat's pajamas. My teacher, in her deepest and angriest voice, whisper-yelled, "WHO is WHISTLING?" Then, one of the kids in my class yelled, and all the kids giggled, and my teacher slammed her hand on her books. We became dead-silent. Then she looked at us, giggled, and said, "Oops, I didn't mean to slam my hand that hard. I'm sorry I lost my temper." One of the kids in my class apologized for yelling, too. We had a conversation about how even teachers lose their tempers sometimes and what it feels like to repeatedly ask someone to do something and have them not do it. She called a couple kids up to the front of the room to be the "teachers," and my teacher pretended to be a "student." The "teachers" had to call out a demand, but the "student" kept ignoring them, being silly, etc. Eventually, the "teachers" were yelling at her to listen. It was a lightheated way for her to get her message across, and all she'd have to say was, "Repeating myself is no fun," and we'd all behave. We felt respected, and we understood her. Next time you lose your cool, just apologize and use it to model appropriate behavior. Teach kids how to treat you and each other in the calm moments, too. You lost your cool because you care. Your regret stems from love, and the kids will certainly pick up on that. Sometimes, if I am reaching my breaking-point and feel like yelling, I will whisper instead. Not in a creepy or she-may-have-a-screw-loose kind of way, but in a fun way. "If you can hear me [take out your book, grab a pencil, clean up, pat your head and rub your belly]." The kids who are listening will do it, and soon the rest of the class will wonder why everyone is doing it and will get on board. Other times, I'll tell them my throat hurts and that I don't want to have to talk over them. Sometimes I'll say I am starting to feel frustrated and would like to feel proud instead and ask if they can help me with that. Works like a charm. Empathy works wonders here. Occasionally, I'll use a pouty lip face. I channel my best inner Pout Pout Fish, puppy-dog eyes, and just look at my class. It quiets them instantly. Then I'll give them a big smile. Thankfully I teach elementary school, but you maybe could get away with this if you make it super obvious you're joking in the upper grades. Here and there, I'll pull the Hulk card and tell the class they wouldn't like me when I'm angry. I say it with a smile, of course. From time to time, I will clap a pattern for the kids and have them clap it back. I'll tell them I'm watching for kids who are [insert appropriate behavior] to high-five. A lighthearted, "Really?" with a headshake and a smile sometimes is more redirecting than a yell. Humor is a great de-escalator, because it lights up an entirely different part of the brain. When you want to yell, pull out a positive reinforcement strategy instead. Replace, "Why doesn't anyone have their books out?!" with "I'm looking to see who has his or her book out and is ready to go." Rather than, "Sit down!" use, "Who is making me proud and sitting in his or her seat?" Instead of, "We're not going to have time to get through this!" say, "Remember yesterday (or in September) when you were really quiet and worked hard on your paper? That was awesome. I appreciate when you do that. Let's do that again today!" Replace, "You need to pay attention!" try, "What a difference it makes when you pay attention and put forth your best effort. If you keep that up, I see really big things for you/you'll probably earn an A on this assignment/your reading will improve so much." When you want to yell, point out something they did well instead, and ask them to emulate it again. Caution-- when a child hasn't experienced success or doesn't believe in herself, this won't be motivating. Try first showing the child one small thing she did better today than she did yesterday, and tell her it was because of her hard work or how proud you are of her. Then, tell her that she can use that same effort again to do whatever task you ask of her next. We have a lot of stress, and sometimes even trauma, that we bring with us as we look out at all the little faces in our classrooms. Hindsight is 20/20; worry is a rocking chair; and you are human. It's okay to not be 100% all the time, as long as you keep working to be better than you were yesterday. Your regrets stem from love, and you reacted strongly because you care. You really, really care. That is evidenced by the fact that you've read this post, lost some sleep, or cringed at yourself. Guilt won't change what has happened, but you can channel that guilt into making a plan for the future. Cut yourself a break as you hold yourself accountable. Think of each guilty moment as the learning experience that brings you closer to being the teacher you want to be. Shower that kid with tons of positive attention moving forward. Learn from it. Forgive yourself. You are one of the good ones. You just had a day. Make tomorrow a better one. Have you been there? Do you have any other ideas that help? Share in the comments below. I'm currently a 5th Grade Resource Room/Learning Support teacher and K-2 Title 1 Reading Specialist. Previously, I taught Elementary Emotional Support and K-2 Learning Support. I have a Master's degree in Reading Education with a Reading Specialist certification and a Bachelor's degree in Special Education (N-12) and Elementary Education (K-6). I received the Rosemary Carroll Kazimer Medal for Excellence in Elementary Education in 2010. I hope this blog is helpful to you and your students! Thanks for visiting! © 2014 Brandi Felkowski - A Peach for the Teach. All rights reserved. No portion of this Blog may be copied without permission of the author.